Oh my god, they dealt Kenny! Almost every popular franchise has an app tie in these days, ranging from match-three puzzlers to RPGs. The card battler is becoming increasingly popular these days, and with a card collecting mechanic it’s ripe for a liberal dashing of microtransactions. 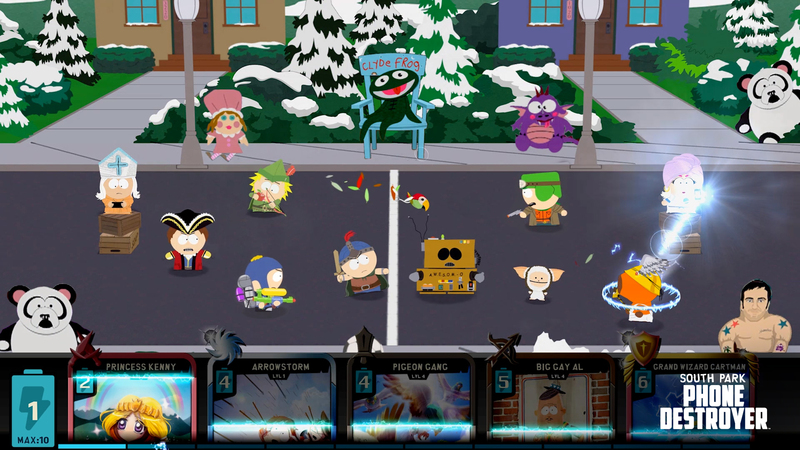 This time around it’s the turn of South Park, with a take that’s part scrolling fighter and part Clash Royale. In typical controversy courting style, the kids are playing Cowboys and Indians, giving them an excuse to pepper proceedings with the series usual brand of un-PC humour. 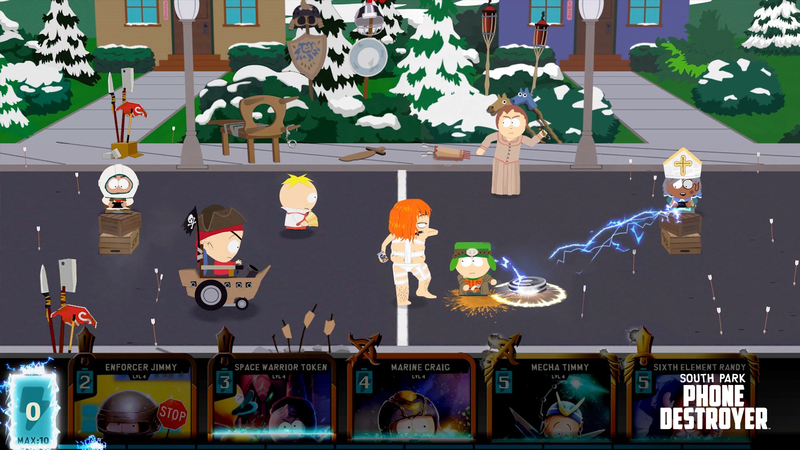 Doing away with the typical hero character selection and the cards being underlings, you control ‘the new kid’ and through the power of some app you summon the South Park characters through playing cards. Each card has a numerical value attached to it, and requires that much energy to summon, just like Clash Royale. As you move along you’ll be beset by enemies and will need to play cards to combat them. The cards come in five flavours: Tank, ranged, fighter, assassin and spell; and of course they come with their own customary strengths and weaknesses. These cards can also be upgraded by paying coins along with upgrade materials, until you then need a certain amount of cards to unlock the next set of upgrades. Phone Destroyer delights in hampering your progress as much as is possible, with upgrade materials and card duplicates in short supply. This in itself isn’t so annoying, as the early challenges the game throws at you aren’t really difficult, in fact they even promote repeat play on harder difficulties to earn better rewards, giving you ever more reason to upgrade your cards with ever absent materials. As things progress you’ll regularly find your progress blockaded by the PVP maestro Don King Butters, who won’t let you go any further unless you complete the required amount of PVP matches. It’s obvious why Redlynx has done this, the idea with card battlers is the competitive online element, get people hooked on this and the likelihood they’ll spend money to upgrade their decks rises. The thing is, the multiplayer is not as much fun as the single player game. There’s some delicious humour tucked away in here, with more than a few gags involving send ups of the series’ running gags. But that personality is missing from the PVP. The actual player against player fights take place on a small court, with you trying to take each other out by playing cards and countering each other. First one to die, or the one to lose the most health when time is up loses. It’s a solid idea, but one that ends up devolving into throwing out units and overwhelming with sheer numbers. While there is a tactical element (some units deal area damage, while others go with single targets), scattering units around tends to have the desired effect and can see you winning battles fairly easily. The fact that the multiplayer gets in the way of the single player action is irritating, as just when you get into a rhythm and start to allow yourself to enjoy the game you’re waylaid with another diversion. It doesn’t stay as just Cowboys and Indians either, later the game goes into sci-fi and fantasy. Thing is, when the new settings come in there’s a whole host of new cards, and these have their own upgrade needs from the new levels, meaning that if you want to upgrade your existing cards (you don’t automatically get new ones for the new theme) you’ll need to go back and do past levels to get the required upgrade materials. Being a free game there’s the usual content store where you can buy more packs – which are better than the regular free ones the game dishes out – you can also buy more upgrade materials with coins and can earn more packs through PVP play. As I made clear though, the PVP isn’t really enjoyable, and making it get in the way of the vastly superior campaign is to the game’s detriment. Thanks to a sharp script there are laughs to be had here, but they’ll dry up by the time you find yourself having to play three PVP matches to progress. For shame. 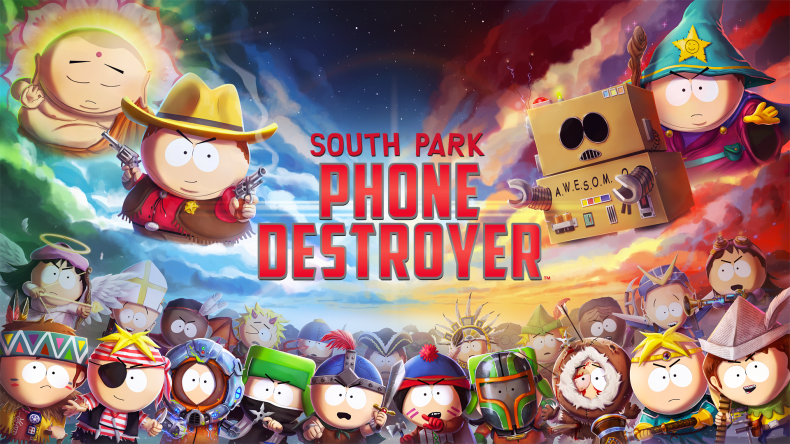 Phone Destroyer isn’t going to convince you to like South Park or card battlers if you didn’t already, there’s a decent campaign frustrated by constantly gatekept content.